Blackberry's fall from grace has been good news for Microsoft, as Windows Phone is now poised to take over the third place spot in the mobile OS race. Projections based on current adoption rates indicate that Windows Phone users are expected to outnumber Blackberry's faithful by November, according to web usage data from StatCounter. StatCounter's data shows the percentage of mobile users accessing the web from various operating systems. The shift is mostly the result of users switching away from Blackberry, with web usage data showing the ailing OS dropping from a 6 percent market share to around 3 percent since the beginning of 2012. Windows Phone adoption is growing, but at a much slower rate, climbing from just under 1 percent market share to about one and a half percent now. If Blackberry and Windows Phone continue their current trends, Microsoft's OS will overtake Blackberry with still less than 2 percent of the mobile market. The news comes on the heels of survey results TechRadar reported last week that BlackBerry device usage saw a 25 percent slump in the U.S. between September 2011 and July 2012, dropping down to 1 percent by the end of last month. While the outlook is bleak, Windows Phone can only hope to overtake BlackBerry if current trends continue without interruption. 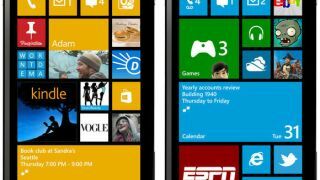 An interruption like Windows-powered handsets launching this October alongside the Windows 8 desktop and Windows 8 tablet OS. How much of a boost the Windows platform will give Microsoft's smartphones remains to be seen, though we'll get a better sense of the impact during Nokia and Microsoft's special September event. RIM, on the other hand, is not faring so well. The company is still in a transition as it readies its BlackBerry 10 platform for a launch at the start of 2013. However, next year may be too late if Windows Phone jumps ahead by a significant margin carried by the new OS and a slew of new devices.